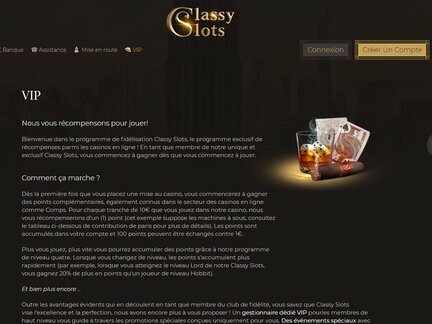 Newly registered players at Classy Slots Casino will be welcomed by a jaw-dropping welcome package on their first 3 deposits made. Players will be entitled to a gratifying 400% welcome bonus up to a maximum of $800 on their initial deposit. The second and third deposits made at Casino Classy Slots will also be entitled to a 400% match bonus up to a maximum of $800. This essentially gives players a mind-blowing $2,400 in bonuses spread across their first 3 deposits. The playthrough requirements for the welcome bonuses is only 33 times and players will have a maximum of 15 days to meet the playthrough requirements on their accounts. Apart from the extraordinary welcome package, the online brand also offers a terrific range of promotions specifically designed for loyal, existing customers. Players will be treated to a Spin Boost promo each and every day, once a day. This promotion essentially gives you a free spin on a slot that comes equipped with free spins, added money, zero wagering spins, and match bonuses. If you are lucky enough to land three of the same symbols, you'll receive a prize in your account. The site also provides a Late Night promotion where you can claim a 100% match bonus when you use the bonus code coupon: LATENIGHT before making a deposit. Please note, however, that the Late Night voucher is only available from midnight to 8am daily. Lastly, the site also comes equipped with a Game of the Week promotion where players can earn an additional 10% in cash on all winnings. Apart from the stellar line-up of promos, this site is home to a marvellous VIP program that features a total of four tiers, including Silver, Gold, Platinum, and Black. Players will receive 1 point for every $10 wagered and the more you climb up the tiers, the more rewards and benefits you will unlock. The VIP program offers additional match bonuses, no deposit free spin offers, comp bonuses, and more. When we compared this brand to Enzo Casino, which is basically a sister site that is operated by the same company, we realized that the site is far more generous in terms of their welcome package while providing the same wagering requirements. They also offer a greater variety of games from more software developers. ClassySlots is considered the new kid on the block, catering to online enthusiasts from across the globe. Its primary objective is to facilitate players situated across Europe, but it also accepts customers from other countries around the world, hence the 11 supported languages and 8 currencies available on the site. Even though it's a brand-new operator, there's already a massive following from players in Canada, especially from British Columbia and Ontario. Classy Slots Casino comes equipped with over 400 different games in several categories, including Featured Games, New Games, Video Slots, Card & Table Games, Live Dealer, and Other Games. The range of games within the site's library are provided by a vast selection of software developers, such as Booongo, BetSoft, SA Gaming, NetEnt, Fugaso, EvoPlay, Booming, BestSlots, Felix Gaming, Noble, Irondog, Leap, 1x2 Gaming, Wazdan, GS, Mr Slotty, Playson, Xplosive, Evolution Gaming, SA Live, and Lucky Streak. All games offered can be enjoyed on your desktop and mobile devices, including Windows, iPhone, iPad, and Android devices (you don't need to download an app). The biggest selection of casino games is video slots. Some of the most popular slot titles include Vikings, The Mummy, Fear the Zombies, The King Panda, and Warlords Crystals of Power. Players will also find a decent selection of table and card games, such as roulette, blackjack, baccarat, hold'em, and three card poker, along with a variety of video poker titles, including Caravan Poker, Deuces Wild, and Jacks or Better. The casino also offers a fantastic variety of live dealer games from 3 software developers with games like Blackjack Live, VIP Blackjack, French Roulette, Live Baccarat, and Live Hold'em along with a sensational selection of Jackpot Games where players will find slots with spins, multipliers, progressive jackpots, and more. Classy Slots Casino boasts with nearly 30 different progressive jackpot games, offering loads of opportunities to trigger a life-changing sum of money. Some of the most popular jackpot games in the operator's library include Olympia, Smoking Dogs, Double Cash, Plagues of Egypt, The Giant, and Sunset Wild. Although the operator is still considered relatively new, there's already been a wide variety of wins at the site with figures reaching into the thousands. As a relatively new online casino that only opened its virtual doors in early 2019, it should come as no surprise that the operator hasn't picked up any players complaints as of yet. Everything about Casino Classy Slots is phenomenal and the company's sister brands are also in good standing in terms of player complaints. This essentially means that they have an incredible customer support desk with a decent feedback system to ensure all player requests and queries are answered in a timely manner. Should there be anything to report in the near future, we will update this section accordingly. For now, we will give the brand a 5 out of 5 rating. The site is operated and owned by Game Tech Group N.V and is regulated and licensed by the Curacao Gaming Control Board. ClassySlots was initially established in early 2019 and is also frequently tested for honesty and fairness on all games by independent third-party auditing companies while also using a random number generator, guaranteeing fairness on all bets placed. Classy Slots Casino provides a sophisticated and modern approach to online gaming. Although it does not feature a dedicated mobile app, all the games can be accessed directly from the site on your iPhone, iPad and other Android mobile devices. Newly registered players might not be welcomed with a no deposit bonus, but the 3-tier welcome package of 400% up to 800% on each deposit certainly makes up for it. The LATENIGHT coupon voucher for night owls is also a plus where players can walk away with a 100% match on deposits made after midnight.